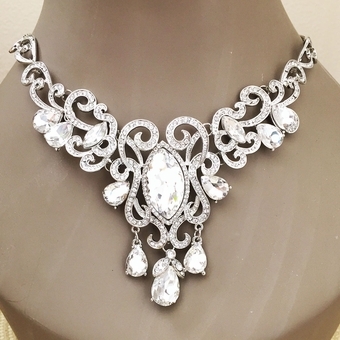 This dazzling jewelry set, an elegant choice for your wedding or prom or pageant, has a variety of clear rhinestone crystals - both large and small - in an attractive design, all on a durable rhodium base. The necklace itself is 18 inches long, with an additional 3 inch extension. The matching earrings are 1-1/2 inches long.